The solar panels cover approximately 50,000 sq. ft. of roof space (just over one acre) and have a rated capacity of just over 500 DC kilowatts. Virnig Manufacturing's large new rooftop solar electric generator with its array of solar panels has begun powering approximately 40 percent of the electricity (annually) for its growing manufacturing business. This clean energy is being produced by more than 1,500 JinKO solar electric panels on the factory roofs at 101 Gateway Drive, Rice, Minn. The solar panels cover approximately 50,000 sq. ft. of roof space (just over one acre) and have a rated capacity of just over 500 DC kilowatts. Virnig is no stranger to efficiency in business operations. With the Virnig family in the fabricating business for more than 27 years, Virnig Manufacturing is an industry leader in skid-steer attachment manufacturing. Using highly efficient laser cutters, premium components, power coat painting and robotic welders, Virnig has reduced its electric bill significantly while speeding up its manufacturing processes several-fold. The buildings are designed so efficiently that they need very little additional heat or cooling. Now with solar on the roof, their electric bill will be cut by $4,000 or more per month, on the average, according to the company. This is one of the largest private commercial arrays of solar electric panels in central Minnesota. Solar electric or photovoltaic (PV) panels use photon energy packets from the sun to make electricity. There are zero emissions and no moving parts in the panels. In the harsh climate of outer space, solar panels have lasted for many decades. Cell phones work in large part because of solar panels working faithfully in space. These solar panels are guaranteed to produce at least 80 percent of their rated power for at least 25 years. “By utilizing tax incentives and available grants we were able to cover our entire facility with solar and see it pay for itself in under 5 years. Electricity prices keep going up. This helps us reduce costs and stay competitive,” said Bryan Virnig. Winkelman Building Company (WBC) of St Cloud, Minn., designed and built the efficient, sturdy buildings which hold all the solar panels, ballast and racking on the flat roofs. WBC also was also the general contractor for the solar project. 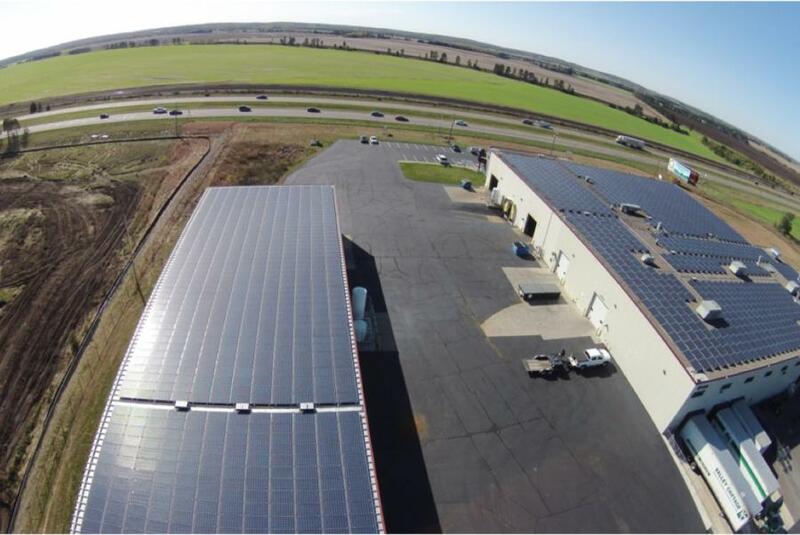 Innovative Power Systems (IPS) of St Paul, Minn., designed the entire solar system, and Oxbow Sunworks of Stillwater, Minn., installed the system on the two main building rooftops, just north of Rice, Minn., right near highway 10. The workhorse of the system is the JinKO module. JinKO is a leading manufacturer of solar modules and warrantees warranty its products to produce at least 80 percent of their initial power at the end of the first 25 years. Solar modules have lasted for more 50 years in outer space so the company believes they will produce power for many decades after the warranty. The 500 kilowatt DC array will produce about 600,000 kilowatt hours (kwh) per year on the average, which at the value of 10 cents per kwh, will yield about $60,000 per year, plus there are incentives such as 30 percent tax credits, bonus depreciation, a USDA grant, Green Credits (SRECs) and Net Metering, which reduce the cost and create a pay- back of about 5 years. This is enough to power 60 average homes. For more information, call David Winkelman at 218/764 2321 or visit www.winkbuild.com.